← Making Silk Cushion Covers – Using Ready Made Ones or DIY? 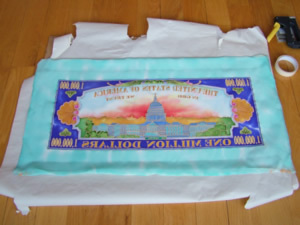 Here at long last (without any real desktop publishing tools) is my response to the request for more visual material on how to stretch your silk painting onto a canvas frame. As many of you will know I have already published an article which describes this process. However, a picture speaks with such clarity, doesn’t it? So here I have a small tutorial for you with pictures and words. To get started you should have the proper tools at hand so that the process flows as easily as possible. This is what you need: a large board or surface to work on, a roll of masking tape, a stapler (not the small sort you use in the office), a measuring stick or tape, a sheet of paper to protect the silk when working, a chunky artist’s frame of your choice which should be a approximately 15 centimetres smaller than your silk painting in both width and breadth, a Stanley knife and of course, last but not least, your beautiful work of art. 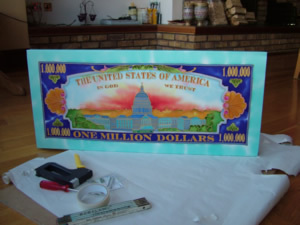 As you can see we are busy framing a one million dollar note reproduced in silk. 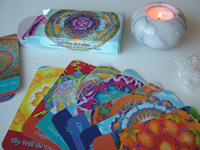 If you’re at all into Feng Shui, then you’ll know that this is ideal for the prosperity corner. 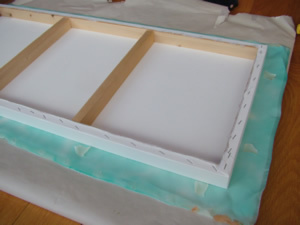 Step One: Place your board on the floor or table, lay the sheet of paper on top of this and finally place the artist’s frame on top. . Now lay your silk art face up around the canvas frame. 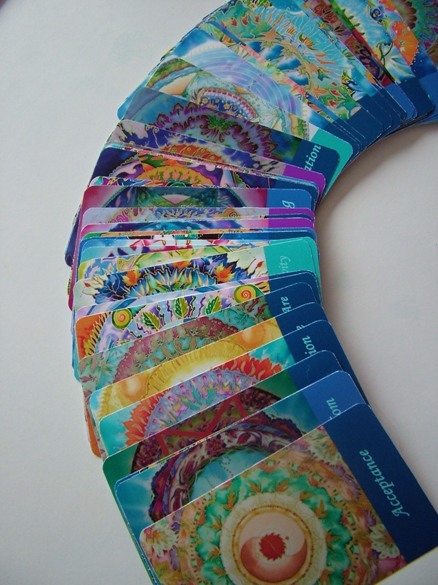 Lightly fold it over the edges. You don’t need to worry at this point to centre it as you are only taking the measurements. Now lay your measuring stick across the top surface to measure both the height and width of your picture. Step Two: Now remove your silk painting again and lay the frame to one side. You will be needing it again in a moment so have it to hand. Step Three: Lay your silk painting face down on the paper and using the measuring stick and masking tape, measure out the dimensions of the frame. If your frame is 50cm wide, then make sure that you have an equal amount of background both left and right of your image, and mark these with the masking tape, so that the frame will sit nicely centred. You can see from the photo that our picture had 4cm on both sides. 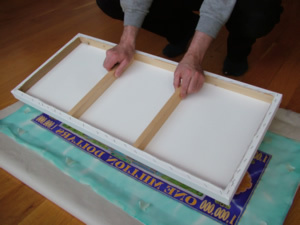 Do the same for the top and bottom, placing pieces of masking tape to show the outer edges of the frame. 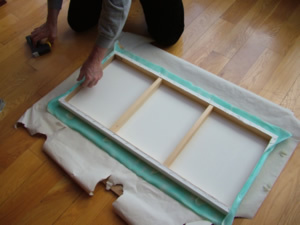 Step Four: Now take your canvas frame and gently lay it down on the silk, taking care to align the masking tape with the edges of the frame. 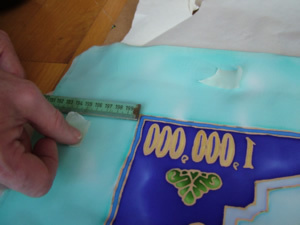 Step Five: Now you’re going to start the actual stapling of the silk onto the wooden frame. You can see quite clearly why the silk needs to be a few centimetres wider than the frame for the wrap around. Start in the middle of the edge nearest to you and pull the silk firmly up and over the frame. Holding it down flat, staple the silk firmly in place. Proceed with the opposite edge. Repeat this for the remaining two edges. If your work is on the floor, it’s quite easy to move around in a circle. Next add staples halfway between all the ones you have already attached and repeat this process until the silk is snugly stapled all the way around the frame. Don’t staple too close to the corners. Step Six: Next you’re going to attach the silk at the corners. 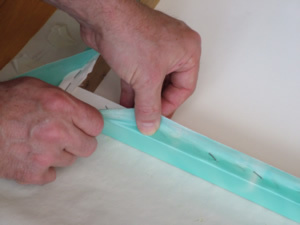 Tuck the excess silk underneath and fold an edge to make a 90 degree angle, with the fold of silk lying along the edge of the frame (see photos 6a and 6b). Firmly staple the silk in place. 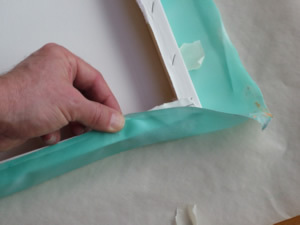 Step Seven: The remaining excess silk gets folded back in the opposite direction (to the outer edge of the frame). 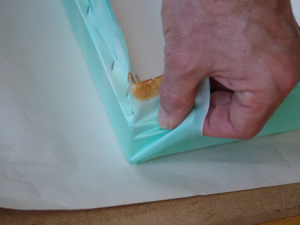 Fold so that the silk is flush with the corner of the frame (Step 7) and on the top tuck the last silk in diagonally towards the middle of the picture. Firmly staple in place on top. DO NOT staple where the silk is visible. Repeat on all four corners. Step Eight: Lift the picture up to check that everything is nice and straight from the front. 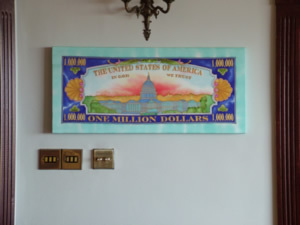 The million dollar note needs to be very straight due to the straight edges in the painting. You may get away with less precision with other images. Should you decide that anything needs altering, ie. the image is a bit squint, then carefully turn your picture back over, undo the staples and readjust your silk. Step Ten: Your picture is now ready for hanging. The beauty of this method is that you only need 1 nail as the picture is so light-weight compared with a traditional frame. You may need 2 for larger pictures. In this case we used two. Knock in the first one, hold up your spirit level and mark where the second one goes. Knock it in too. And now you can hang your picture. Eh, voila. You have a beautiful work of art, framed to perfection which shows off your artwork wonderfully and it hasn’t cost you a fortune to do it either. Enjoy. This entry was posted in SILK PAINTING and tagged canvas frame, Fiona Stolze, how to mount a silk painting, silk and art, SILK PAINTING, SILK PAINTING TECHNIQUES, silk painting tutorial. Bookmark the permalink. The wordpress blog seemed rather overwhelmed at so many photos that we had difficulties putting this together. After much pulling out of hair 🙂 I decided that broken lines, non-aligned photos, etc. 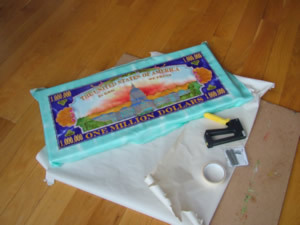 were not as important as the message here of mounting your silk paintings. So perfection aside and let’s be creative. Let me know what you think. Very helpful tips and the photographs nicely reinforced the information provided. You’re welcome. Glad to be of help. You gave instructions with such clarity. Thank you for sharing with us. You’re so welcome. Glad it was of some help. Thanks for this great tutorial–I found it doing a google search. I had question, however, about using canvas: Is it necessary? Are there materials that can be applied over the frame instead? I ask because I need to build a custom frame for a beautiful silk scarf that I bought in Venice. To have the frame custome built (with canvas) is going to cost over $200. I plan to build the frame myself and I’m trying to figure out if I absolutely need to learn to stretch canvas over it. Thanks for the help! Glad you found this tutorial useful. And thanks for your question. Basically you don’t have to use canvas on the wooden frame. The reason we use it is because it gives a really sturdy base for your silk. You can however just attach your silk straight onto the wooden frame. That works too. However if you have a white background, the colours in your silk are much more vibrant. 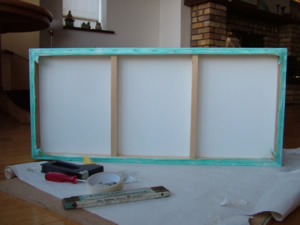 If you go for canvas, then you would simply buy the length you need and give it one or two coats of white paint and then when it is thoroughly dry, just fix it onto the wooden frame in exactly the same way as you would for the silk as described above. 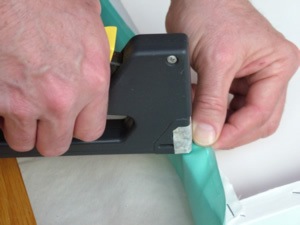 All you need to watch for is to pull the canvas very firmly in place at the corners before stapling in place. I hope this helps and do let me know how things work out. Thanks Fiona for the response. What color canvas do you recommend for dark silk The silk I have is a very dark blue, almost black. The colors on it are earth tones. Overall, the whole thing is pretty dark. Do you still recommend a white canvas? Also, can you recommend anything in lieu of canvas? Perhaps some kind of special paper? You’re welcome Ryan. And yes, I always recommend only white. Even black looks more vibrant with that background. The lighter colours will get swallowed up if you use a darker tone. I wouldn’t suggest using paper of any kind with the fabric. 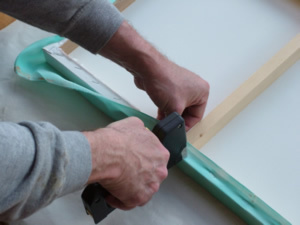 When I am framing silks behind glass I use white acid board backing with a layer of thick white paper on top of the backing board then the silk. Not though when the canvas is open. I would go for canvas covering or the silk alone. Fiona, thanks again. I’ll send you a picture when it’s done. Do you have a recommended type or manufacturer of paint for the canvas? Also, is it the case that you would paint the canvas (as you said above), before stretching it on the frame? I’m about to purchase everything and trying to avoid beginner mistakes. No recommendations Ryan, any canvas primer, but yes definitely paint the canvas first before you start the stretching work. 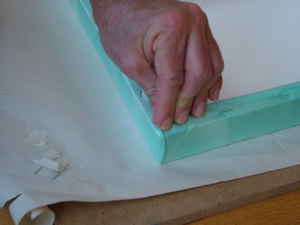 How do you frame your silks under glass – what method do you use to secure the silk to the backing? I just position the ironed silk onto the backing and fix it with a little glue around the edges. It’s been my personal experience that tape is a waste of time as the silk slips and forms folds and creases. You can try some very sticky double sided tape but just around the very edges where the silk is under the mount. Hope that helps. Thank you for sharing. You always have easy complete directions. The pictures help immensely. Hi Richere – your silk is equally protected either under glass or without it. 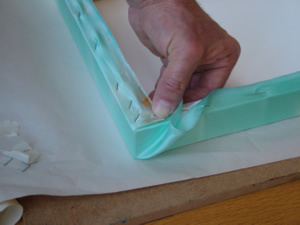 Steps you can take to protect your silk are buying UV glass and framing your work with that. Which I had have done for some larger pieces but the protection is only partial and the UV glass is very expensive. Another option is to paint a coat of varnish over the silk which makes it hard and darkens the colours quite a bit. You don’t retain any of the original silk qualities. I know many artists who do this. I have done it myself and it is quite tricky to keep bubbles from forming. I don’t know about the archival spray but you could certainly try it on a piece of silk. The acid dyes are light sensitive and will fade slowly over time regardless of what anyone tells you. The altnernative is to use the silk paints which are pigments and do not fade in the same way. They are heat set and have a matt look as they only sit on top of the fabric.